Although I'm on call right now and we've had some problems at the start of recent nights (yes, one of those was my fault, but there have been other issues), I decided to risk it and head to my favourite neighbourhood photography place shortly before sunset. It's only about a mile from home and I took the cell phone, so if we had an emergency I wouldn't be out of touch or too far away from my computer. 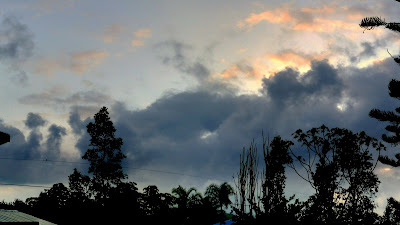 The sky looked amazing and wanted to try and get a few photos that weren't taken from the lanai. Yesterday, in "Tom's flora and fauna" post I wrote that after surveying the yard all hell broke loose and I ended up on the phone with the guys at the summit trying to fix a problem. Well, I certainly fixed it, but today I found out that I was the one that caused the problem in the first place! Oops. Oh well, just deserts as they say, although I also ended up spoiling someone else's early evening at home for which I apologise profusely. 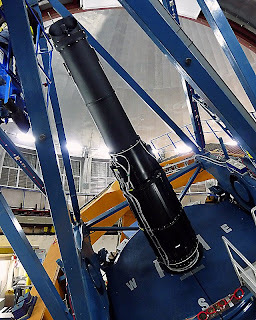 During some end-of-day checks before the observers got going at night I managed to accidentally hit the wrong software button which resulted in some spectacularly unpredictable symptoms and a broken telescope. These things happen although I've always taken pride in making sure operations run as smoothly as possible. What's even more ironic about this is that I screwed up during the end of day checks which are supposed to catch problems before we observe at night, and it was during these checks that I caused the problem! Fortunately I managed to get the observers on sky again before it got really dark, but boy, I feel bad about this. Do you want even more irony? I was the one that developed and instituted these checks in the first place. Don't worry, I've slapped my forehead a number of times today. The punishment is self-imposed - my Friday and Saturday evenings will be spent making sure things run as well as they can. Actually, that was always the plan, I'm the on-call person right now, but I have to make this up somehow! At least tonight's sunset looked interesting from my home at sea level, but it turned out to be a really boring view in the end. Oh well, I'll accept the punishment and I'll never make the same mistake again. 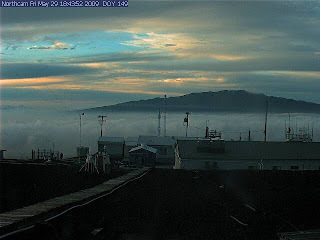 Incidentally, the picture at the top was captured by the north facing webcam at the NOAA Mauna Loa Observatory at sunset this evening (it points towards Mauna Kea). My sunset view from home was so boring I'm not even going to bother posting it. 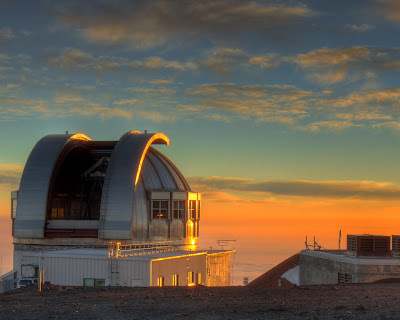 I'm back on Mauna Kea late Sunday, so perhaps I can take a couple of nice pictures then. I took a walk around the yard this evening not suspecting that all hell would break out at the telescope and I'd be on the phone for the next hour or two trying to fix the problem. The walk was actually more of a survey as I really need to get working on the yard again. The place has taken some real hits from the floods and droughts of the last couple of years. I took the camera with me, of course! Dead and alive: More curly wurly flowers, one very much alive, one very dead. Boy, these things screw up the camera's autofocus like nobody's business. Pine cones: I've not noticed these before, but the Norfolk pine out in the front has some cones. Don't look too close, the picture might induce migraines in some people. It's a very fuzzy tree. Pineapple plot: It really is a pineapple plot, only one seems to be growing this year. It'll be ripe in two or three months and if previous years are to go by will taste like heaven! Euginia uniflora: It took me ages to finally identify these cherries a few years ago (Surinam cherries) and was then brave enough to actually eat a couple of them. What can I say? They look quite pretty and I won't be trying out any Surinam recipes anytime soon. The croton: A really colourful bush-type thing with lots of leaves (you can tell I'm an expert gardener, can't you?). The fauna: I actually have a couple of croton plants but one is fairly inaccessible until I actually clear away some of the jungle. I did have a look at it though to see if it was still alive and there was a little friendly lizard on the leaves (the ones furthest away from me of course). So, I poked the camera through the foliage and tried to capture a couple of images before I scared it away. The freaked out fauna: I got about 5 photos before it turned and scurried away and most of those were rubbish. Sorry for disturbing you little fella. The mosquitoes were really biting by this stage so called it a night, only to be rudely disturbed 10-minutes later by cries of help from the summit. In the odd spare moment I've been trying to learn a little more about high dynamic range photography (HDR). Ant has been really helpful in this and I've also recently bought "High Dynamic Range Digital Photography" by Ferrell McCollough which is definitely an interesting read. Unfortunately neither the weather nor work commitments have allowed me to take the time to experiment until today. This evening I tried a quick test of HDR vs. a regular photograph. The results are interesting. Firstly, HDR really does help bring things out that you don't see in one single photo. On the other hand, at least in the brief test tonight, image quality suffers. I suspect taking pictures of flowers really isn't the right way to do this though. Although it wasn't windy I did find a gentle breeze would really screw things up! 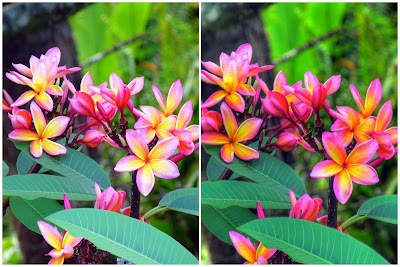 In any case, the picture above shows the regular photo on the left and the HDR photo on the right. The latter used 5 images from -2 stops to +2. I had a +3 image but the wind made that too blurry. These aren't great pictures by any means, but I thought it would be interesting to show the difference between the two techniques. Next time I'll try this on something that doesn't move in a gentle wind - a building for instance. Oh, back up the mountain late this weekend. Maybe I can experiment up there, circadian rhythm be damned. No pictures today, no news or anything really, but during my lazy day observing Memorial Day and getting my circadian rhythm back to where it ought to be (it won't last long, believe me), I spent a little time reading "The Daily Flow" authored by Anna. In my opinion, Anna lives in the most beautiful and special place on this island and possibly the whole planet. The coastline around Kalapana is stunning; I've blogged about it in the past, more than once, but "The enchanted forest" probably covers most of what I'd want to say now. It's where I go when I'm feeling particularly stressed or low because I know I'll leave feeling an awful lot better! It's nice to see that someone else thinks that this special place is, well, special. And beautiful. My only complaint is that I can't leave comments on Anna's blog because I need a Wordpress account in order to do so. I hope that gets changed soon! 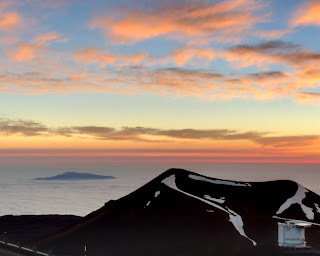 A typical scene at the summit of Mauna Kea during a summer sunset: the shadow of the mountain to the left, tourists atop the summit and the shadows of the tourists watching the sunset just below UKIRT projected onto the summit's west-facing slope. I wonder how many of the visitors above actually turned around and saw their own shadow? What's this doing up there? A couple of weeks ago I noticed an unusual flower growing near one of the dormitories at Vacation Resort Hale Pohaku, up at the 9,000 foot level of Mauna Kea. Unfortunately I had neither my camera nor the time to take a closer look, but at dawn this past Saturday I managed to take a couple of pictures. I didn't have a clue what it was, I've not seen this plant on Mauna Kea before nor did it have any of its own species nearby. 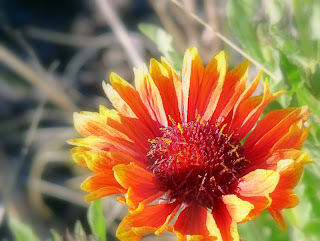 Well, it took the brainstorming power of five astronomers last night but I think we identified it - a dwarf red sunflower although I'm still not absolutely certain, so if anyone knows for sure, please let me know! Dawn this morning revealed that the flower pictured at the top was looking a little unhealthy, some of the petals had come off, but a new flower was now beside it. Next time I'm up I'm going to have a look around because I'm really curious as to how this plant got up there. Are there sunflowers at the Onizuka Center for International Astronomy Visitor Information Station? It's relatively nearby. It doesn't seem to matter if it's day or night, whenever I have to drive somewhere the headlights are on. The vog is terrible and instead of sunny Hawaiian skies we're exposed to dark grey and gloomy clouds. These days the sun sets at around 7pm but from 3pm onwards the sky is so dark you'd think the sun took a shortcut. It's one of the consequences of living on an island of active volcanoes. A few posts ago I predicted that we'd seen the last of heavy snowfalls at the summit of Mauna Kea this season and I'll stand behind that prediction. What I didn't predict is that the weather would remain so bad that it's been almost impossible to obtain really good data. We've had a few nights when we've managed to do that, but on the whole this has not been the Spring months that I remember. I'm back at the summit supporting some VIPs this holiday weekend. Given the latest summit forecast my stay at the summit might be longer than planned. We won't be getting heavy snowfall but high winds and icing are a real possibility. The forecast calls for conditions getting better midweek but then going to pot again late next week - just when I'm back up again! Maybe I need to take some leave just to see if everyone might get some nice weather again! It'll also give me a chance to find out where I've put the battery charger for my camera. I know I left it somewhere sensible - perhaps out in the lanai somewhere where I knew I'd never miss it. Well, it happens to all great shows in the end. Some go on longer than they should and some end prematurely. I remember sitting down with my father in the late 70s to watch some of the greatest TV comedies ever made - "Dad's Army", "Fawlty Towers", "The Fall and Rise of Reginald Perrin", "Yes Minister" and "Yes, Prime Minister" come to mind. I've moaned about the UK recently but if there's one thing that place can do, or at least used to be able to do, is create wonderful comedy. The US can do it as well but I don't think the series they've produced are quite up there with the very best. Mash was great of course, Cheers was pretty good and I love Frasier. Seinfeld was superb of course, but that was a series that just went on too long for me. On the way down from the mountain last Friday I found the fifth and last series of Boston Legal in my mail. I've just watched the last episode. I have to say that this show, at least in my opinion, is up there with the best comedies the Brits ever produced. It's clever, it's very funny, often surreal and deals with everything from the death penalty to fishing and senility. There has been no other series I've watched that has made me laugh so much and actually cry - often in the same episode. For those people who only know William Shatner as being Captain Kirk in Star Trek, I urge you to watch, at the very least, a few episodes of Boston Legal. He won an Emmy for one of the series and all I can say is that it was richly deserved and I hope he wins more awards. The show is now finished and I think it was the right decision as nothing ruins a great TV comedy more than running out of ideas, but I'm still sad that there are no more new episodes to watch. Yet more sunset shots from the summit; these were taken last Wednesday and Thursday. On the first night I was really hoping to see the green flash. It's an optical phenomenon that usually requires a clear horizon and although there were clouds the horizon was well defined (it's extremely rare not to have clouds stretching to the western horizon). As usual, I didn't see the green flash and I have yet to see one from the summit despite eighteen years of trying. I know several people who have seen one on their first trip to the summit. It's frustrating but I have seen the effect elsewhere (in the Australian outback of all places). 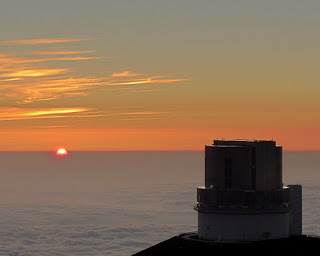 The picture above shows the Subaru telescope and the sun just as it set. The camera was set to take continuous pictures but none of them showed anything green. Oh well, back to the drawing board. In the meantime, here are a few more sunset shots. I can't say by popular request but I like them! Subaru and one of the twin Kecks on Thursday night. There were a few more high-level clouds around which usually makes the sunset more colourful although it also means we're in for a poor night of observing. The IRTF to the right and one of the Kecks with Maui's Haleakala in the distance - a 10,000-foot dormant volcano. The sun had set by now and the cirrus clouds were very red. The JCMT (lower-right) with the summit of the Hualalai volcano peeking through the low-level cumulus clouds in the distance. OK, this one's a little overdone, it's an HDR image of Mauna Loa from the summit taken last Wednesday, but it does show how bad the vog was. It's very rare for vog to reach summit level but it was pretty obvious on the drive up and you can see the layers of the volcanic crud all the way up to Mauna Loa's summit. That mountain is almost the same height as Mauna Kea so the nasty stuff was way up in the atmosphere. I'll go back and work on this one when I have some time. Sunday is often the day people wash their cars, but today was my day to cover it with dirt. It was weed-whacking day which, for the more civilised people in the UK, means mowing the lawn. My yard isn't conducive to the use of a lawn mower and even the bit that looks nice and level has now destroyed three lawn mowers. So it's a powerful weed-whacker instead. It's fun to use, it has the power to bring down small trees, but it also sprays debris all over the place, including on my car. Hopefully it'll rain again soon and wash all that stuff off! While out in the yard I noticed the `Ohi`a trees were flowering. I hope I don't offend anyone by saying this, but I find the `Ohi`a tree quite ugly even if it is endemic to Hawai`i, but when they flower they look quite attractive. The problem was, none of the flowers were below eight-feet, at least a couple of feet above head-level. Never mind, I thought, let's try something out. So I screwed the camera to the tripod and then held the tripod above my head and tried to take some close-up shots of the flowers. This was quite tricky: I had to set up the camera beforehand and then use the timer mode to give me 10-seconds to hoist the camera up into the trees and hope the pictures would look OK. It took several attempts, but ended up with a couple of nice pictures. Camera shake is a really big issue when holding the thing so far above your head! Next week: how to use your tripod to take pictures around corners. Most of the tourists that visit the summit of Mauna Kea each evening congregate at a couple of spots that offer a great view of the sun setting over the Pacific Ocean. The view is amazing but sometimes the scene to the east can be even more stunning; that's where the shadow of Mauna Kea appears. The other day I posted a picture of the shadow and anticrepuscular rays you can see when looking 180-degrees away from the sunset, but it was only a subset of the pictures I took. Although the main impact of the picture was the shadow and rays, I also wanted to include the cinder cones that were half in shadow and half in sunlight, so here they are. In a place like Hawai`i the seasons tend to blend together and it's not always obvious when it's summer or winter, especially to someone visiting the islands. If you live here long enough though you can tell! On the other hand, another way to check that we really do have seasons is to see where the sun sets throughout the year - or check where its shadow lies. This is the shadow and rays in January. Despite all the gloomy financial and politcal news recently, it's reassuring that the Earth just keeps plodding along in its orbit around the sun just as it's done for billions of years. I hope I have the apostrophes in the right places. Halema`uma`u is the crater at the summit of Kilauea and Pu`u `O`o is the crater that lava has been flowing from since 1984. After an oxygen and sleep-deprived stay on Mauna Kea I'm never at my sharpest. It's why you see so few long blog posts from me from the summit or just after I've returned to sea level. Having said that, though, I'm still impressed with myself for actually spelling anticrepuscular in the last couple of posts. 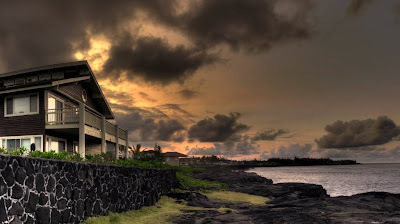 Anyway, the picture above was taken a couple of days ago at dawn from the lower parking lot at Vacation Resort Hale Pohaku. The two volcanic plumes from the summit and rift zone can be seen quite clearly (do you really expect me to type "Halema`uma`u" and "Pu`u `O`o" again?). The picture was taken from 9000-feet and about 35-miles away from the plumes. The vog that they've produced seems to have reached the summit regions of both Mauna Loa and Mauna Kea in the last couple of days and I'll try and post a picture of that soon. It's rare the stuff gets up that high, it's usually capped below 10,000 feet, but the mid-level atmosphere has looked awfully dirty recently. You can actually see the plumes burst through the inversion layer, but I don't think that's the reason the vog has got to the summits - that inversion layer is thousands of feet below the summits of Mauna Loa and Mauna Kea. It's coming to the end of a long night and I'm tired. This wasn't helped by someone banging on my dormitory door at 8:30 yesterday morning - they were looking for someone else. I never really got back to sleep after that. The sunset this evening was beautiful, hopefully I'll have some pictures to show later although you'll have hopefully seen the anticrepuscular ray picture taken earlier. That was taken using multiple pictures using different exposure times and then processed with HDR software. I took several shots of UKIRT as well and processed them slightly differently, the idea was to get more of an artistic picture than a realistic one (using details enhancer in Photomatix Pro). For the first attempt I think it worked fairly well although really I'm just trying to get a feel for the technique. 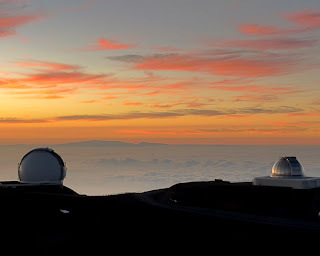 Taken shortly before this evening's sunset at the summit of Mauna Kea. Little snow remains now, but we still get some spectacular views. 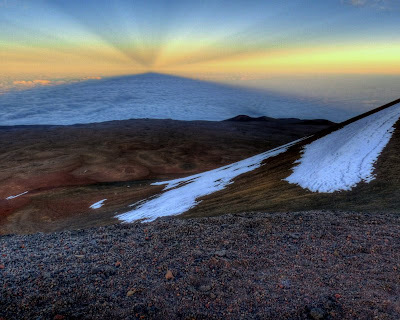 This is a picture of the shadow of Mauna Kea and above it anticrepuscular rays. These are the same things as those sun rays you see through clouds on occasion but on the opposite part of the sky (they converge at the anti-solar point, 180 degrees from the sun itself). The rays are actually parallel, but they're projected onto the sky and follow great circles, so appear to converge. I don't think many of my American readers were ever given the opportunity to see "The Trap Door" and perhaps it's the sort of kid's show that would never be given air time in the US, but it was great! Admittedly I wasn't really a kid when it first aired in 1984 but I loved it the first time I saw it. Although I've had a bit of a go about the UK in a few posts, one thing the country has always been good at is creating good TV, although even that is disappearing down the plughole these days. The first episode was called "Breakfast Time". It introduced us to the stars of the show: Berk (a blue monster), Boni (an undead skull) and Drutt (no idea, a "thing"). Berk was the servant of a huge monster that lived upstairs that we never got to see although during the series we learned that he liked the occasional slime bath, enjoyed grotesque food and had giant eyes that were occasionally removed for cleaning. Berk and his friends lived in an old castle's cellar which had a trap door. If opened it led to a dark and wacky netherworld infested with spooky monsters and the occasional ghoul. Of course the door was opened in each episode, either by Berk or the monsters below. Only two series were ever made (40 very short episodes I believe) but it seems a DVD is available via Amazon UK, so guess what I'll be buying shortly? I'm back on the mountain for a couple of nights. The forecast is good so for a change might actually observe for full nights. If the clouds come in though I might be watching some more episodes on YouTube! OK, so I stole the title from Ant who posted these gorgeous pictures of a log washed up in Hilo Bay. I can't compete with that, but I do have a picture of a log. 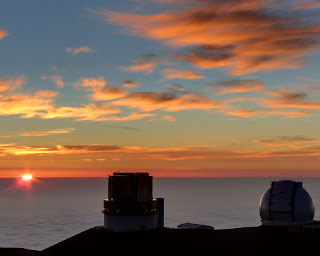 It's up at 14,000-feet on the summit of Mauna Kea, and I'm wondering what on earth it's doing up there. Anyone know? It's next to the lunch hut where those unfortunate observatory day crews who haven't brought up their own food find themselves at midday. Fried fish and rice, cooked thousands of feet below the summit and brought up by a brave HP cook. Yum! Then again, the the orange chicken they cooked for us the other day was actually very good. Generally the views from the summit area are fantastic but this is a spot I wouldn't recommend visiting. Hopefully it'll be cleaned up in the near-future. I don't know what was going on today on our little part of the island but so far reports suggest road work made a lot of people really angry. There's only one road between Puna and Hilo and this afternoon everyone was stuck on it. Usually it's an accident that cuts off a huge part of the island but for those of us stuck in the traffic jam, well, we didn't care what caused it. It's a civil engineering problem that has been caused by, uhm, civil engineers. So what welcome do I get when I finally managed to get home? A pissed off cat. Then again, once they'd been fed they were doing all they could to look cute again. They're not really into remembering a grudge. Although I was on the mountain for another reason, today was cleaning day. 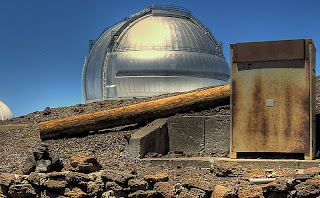 Major observatories need to keep their telescope optics clean, in our case, being an infrared telescope, to reduce the emission from dust particles on the telescope mirror and the instrument's optics that are exposed to the atmosphere. The way that's done normally is to do what's known as a CO2 clean (CO2 being, of course, carbon dioxide). We can't just hose down the optics with soap and water, there a millions of dollars worth of instruments and associated electronics all over the place, so CO2 is used instead as it sublimates almost instantly after it's released in a small jet. 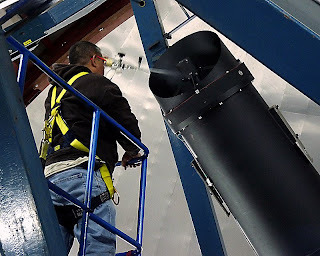 Here one of our technicians is cleaning the instrument's field lense. It's quite a tricky job, he has to work on a crane and access is very difficult, but it's a vital job. The lense is close to the top of the dome, so is exposed to the elements when we observe. In wet and windy conditions dust sticks to the glass and we see that as out-of-focus doughnuts in our images. These imperfections can be dealt with in processing after the event, but as usual, it's best to avoid the problem in the first place. 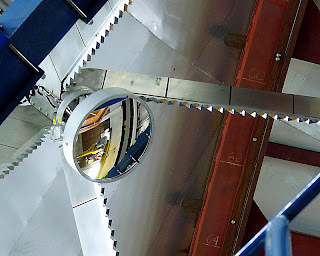 This is the secondary mirror. It's in beautiful condition so no need to clean it today. That's good news as getting access to it is awkward! The plumbing in this place is incredible. 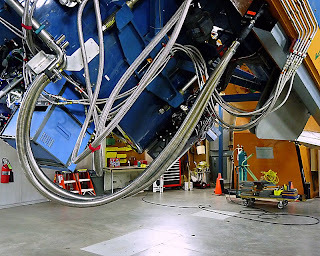 We have nitrogen, helium and glycol lines all over the place which are mainly used to keep our instruments cold and also to cool the primary mirror. They're fed by chillers and compressors in a dark and noisy room down below. All the lines have to be able to cope with a telescope that slews all over the sky without leaking, and it's a surprisingly difficult job. 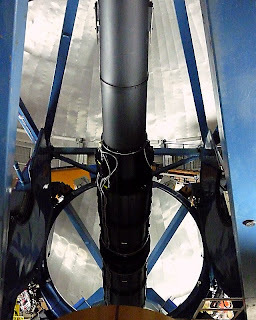 I think all telescopes around the world have had to deal with a leak from time to time. Add into this all the electrical cabling that's required and the need to avoid interference with the instruments' sensitive detectors (generally called "pickup") you can see that we need to employ excellent engineers and technicians in order to function. I think we've done well in this respect. Finally, all spick and span. A beautifully clean primary mirror. Just in time as well, as we really do seem to be moving away from the recent terrible winter conditions and the real Mauna Kea astronomical weather is back with us. I don't know what's been going on with my mind the last few days, but for some reason I keep thinking back to happy days growing up and living in England. The country has become a cesspit in recent years with an increasingly "Big Brother" government so why on earth have I had these feelings? Have you read George Orwell's book "Nineteen Eighty-Four"? The latest attempt by the government to introduce a widely-hated national ID card scheme now has them forcing it on a group of unwilling professionals "voluntarily". The voluntary bit is that the pilots don't have to partake in the scheme. If they don't, however, they can't work as they'll need the ID to get access to their aircraft. That's ignoring the current situation where pilots have to go through the same security as us passengers and can't take a tube of toothpaste larger than 100-ml with them onto the aircraft because it might explode. 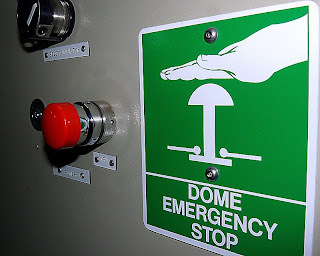 Let's forget the fact that once on the flight deck the pilots will be be able to crash the aircraft into their building of choice whether they have that toothpaste or not - or turn their "office" into a bloody murder scene with a quick swing of the crash axe. Sorry, I'm going off the point. I miss England although I don't want to live there ever again. Despite my opinion though, I still have happy memories of the place. I lived in Preston, Lancashire, for seven years of my life after growing up near London and made many good friends there and still miss the friendly locals and some great pubs! Today I came across this youtube video. It's not the greatest movie in the world but memories of Preston town centre came flooding back. The song's quite nice as well. 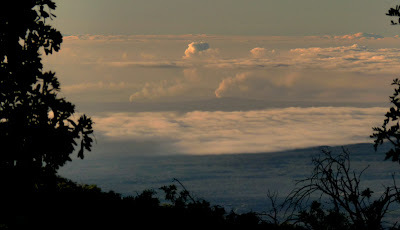 In my last post there's a picture of the clouds at sunset over Mauna Loa. I have another picture, same photos but processed on my old PC, which I think is far more dramatic and is shown above. The problem is that I like this picture, the colours are much more dramatic, but they don't reflect reality. The picture in my previous post looks much more like it did to my eye at the time. There's also a problem with saturation (some of the brighter regions are clearly blown out too much) yet I still like it. What do you reckon? A picture that reflects what you actually see or one that changes the colours and intensity to make it look more dramatic? I'm not sure I can decide. So many unexpectedly expensive things happened during the last week from hell that I haven't had a chance to do very much recently other than order a new cheque book. Fortunately the weather at the summit of Mauna Kea has improved dramatically in the last few days so things are going relatively smoothly up there - it makes you wonder if there really is someone in charge of everything that actually has a sense of humour - let's give those astronomers months of despicable weather and then when it clears I'll make everything they own back home stop working. Ha! I think I've managed to transfer all the important stuff from my now deceased PC to the new one although I'm still having several issues with Vista - I think they're mostly personality clashes though. I'm sick and tired of it questioning my motives every time I try and do something but one day I'll figure out how to stop it doing this. I have solution to this PCness though, a sledgehammer within easy reach. One nice thing about the new but cheap PC is that I can run some of the photo-editing software I have and see the results in a couple of minutes rather than the couple of days my old thing used to take - and without having to keep a fire extinguisher nearby in case it exploded which it often threatened to do. A neighbour joins me watching Kaloli point at sunrise wondering what the new day will bring. The last week has been one of those that I'd like to start all over again if it were at all possible. Last Saturday my computer died. Overnight on Sunday/Monday my water pump died so no water. On Wednesday my car's air conditioner broke in a manner that deserves a separate post, but right now the mechanics don't believe a word I've told them. Today my water heater kicked the bucket and I've spent most of the day underneath the house trying to get hot water again.